Gorbachev advocated the elimination of wage levelling. In a swipe at the illegal parts of the second economy and corruption, he called for a struggle against ‘unearned incomes’ and all ‘phenomena that are alien to the socialist way of life.’ In foreign policy, Gorbachev reaffirmed such traditional Soviet positions as the support of national liberation, peaceful coexistence, and cooperation with the West on ‘principles of equality.’ He gave special emphasis to ending the arms race and freezing nuclear arsenals. In the socio-economic sphere: modernise the machine-building complex and, on this basis, bring about the planned reconstruction of the nation’s economy and its social reorientation; link planning extensively with the development of money exchange relationships; create the necessary economic conditions for the financial self-sufficiency and self-financing of enterprises without state subsidies; and create major scientific and technical complexes. In the political sphere: democratise the soviets, or councils, at all levels; and expand the rights and authorities of the regions, territories and republics. In short: make some limited use of market mechanisms to increase production and innovation, within the context of the planned economy; renew economic infrastructure; invest heavily in technology and science; increase popular participation in existing democratic systems; push hard for multilateral nuclear disarmament. These objectives sounded, and sound, sensible enough. Unfortunately they bear little relation to what actually took place in the name of perestroika. Gorbachev’s reforms didn’t strengthen socialism; rather, they laid the grounds for economic ruin and for the hollowing out of the Communist Party, which was transformed into little more than a training ground for budding manager-capitalists to gain control of assets that they would later get enormously rich from. With the economy spiralling out of control and the party reduced to a shadow of its former self, alternative – explicitly nationalist and anti-communist – alternative centres of power arose to fill the political vacuum. With the support of a nascent capitalist class and the global mass media (not to mention western governments and intelligence agencies), these organisations gained sufficient strength that they were able to force through the disintegration of the Soviet Union, the banning of the Communist Party, the dismantling of socialism, and the introduction of the harshest possible neoliberal capitalist ‘shock therapy’. Such was the true harvest of perestroika. Did Gorbachev inherit a crisis? Although Gorbachev and his team would later claim they had inherited a society in crisis, this wasn’t actually the case. There was no serious public unrest in 1985. In spite of assorted economic problems and a degree of popular dissatisfaction (hardly unusual in any society), there wasn’t any serious trouble, and very few people would have imagined that within a few years Soviet socialism would no longer exist. For the most part, people were more-or-less content with the status quo. The economy was growing, albeit slowly. Everybody had their basic needs met in terms of food, shelter, heating, clothing and healthcare. Education and cultural facilities were world class. The social welfare system was unparalleled outside the socialist world. The streets were safe and people had the opportunity to live interesting, fulfilling, productive lives. The Soviet Union’s allies were facing difficult times in Afghanistan, Nicaragua and Ethiopia, but were in the ascendancy in southern Africa – particularly Angola. Vietnam’s economic situation started to improve rapidly after its adoption of Doi Moi7 reforms in 1986, and therefore its reliance on Soviet aid was reduced. Cuba and the Democratic People’s Republic of Korea were doing well. After a very painful quarter of a century, there finally seemed to be a possibility of overcoming the Sino-Soviet split (ties were finally normalised in 1989 – by which time, sadly, the USSR was in its death throes). And although the Reagan administration had stepped up US economic, military and political operations against the Soviet Union, the latter was holding its own. In short, the USSR in the mid-1980s was not a society on the verge of collapse. So what happened? In the field of economics, the major objective of perestroika was to “modernise and streamline the Soviet economy through the introduction of new management techniques and technology in use elsewhere in the world, particularly in the highly developed imperialist countries.”8 The vision was, within 15 years, “to create an economic potential approximately equal in scale to that accumulated throughout all the previous years of Soviet government and to almost double national income and industrial output. Productivity of labour is to go up by 130-150 percent… The implementation of the programme will … raise the Soviet people’s standard of living to a qualitatively new level”9. The two major strategic themes put forward in order to reach these goals were: first, the extension of market relations within the overall context of public ownership, in order to boost innovation and productivity; second, an attempt to “democratise planning”, basically by pulling the plug on the entire central planning system. The former theme was not entirely without merit – it has worked rather well in China and Vietnam, for example. Dismantling the planning system, on the other hand, created unmitigated havoc, as a result of which the USSR, in 1990, experienced negative growth for the first time in its history. Gorbachev’s initial steps in the economy were interesting but inept. The first big reform was an anti-alcohol campaign with partial prohibition, announced in May 1985. Intended to help alleviate the major problems the Soviet Union was experiencing in terms of public health and labour productivity (particularly absenteeism), the reform consisted of a price hike for all alcoholic drinks, reduced production of vodka and wine, an increase in the minimum drinking age (to 21), stiff penalties on drunken behaviour, the banning of alcohol consumption in the workplace, and various regulations in relation to the sale of alcohol. The loss in income was a fairly serious blow to an already troubled economy that derived a substantial portion of its fiscal revenue from the state monopoly on alcohol. Furthermore, the sharp growth in production of illicit moonshine meant that there was no long-term improvement in labour productivity or public health. It also served to extend the underground economy, thereby contributing to the growth of a nascent bourgeoisie with an interest in expanding its market and legitimising its activities. Gorbachev himself would later acknowledge that “the anti-alcohol campaign and how it was implemented was a mistake in the long run”11. With more direct control over their spending, many of the enterprises chose to pay their workers more. Given endemic labour shortages, increasing wages would have felt like a sensible policy at the level of the individual enterprise, because it was a means of attracting and retaining workers. However, at a broader level, the combination of higher wages, ever-worsening shortages of consumer goods and state-fixed low prices served to create repressed inflation. This in turn led to increased black market activity and speculation, undermining the overall economy. Furthermore, increased wages tended to mean less resources for investment; the future was sacrificed for the sake of the present. The result was a further decline in innovation and productivity growth. And although all of this was done in the name of “democratising” production, the new system allowed enterprise managers to exercise unchecked control over vast resources – a position that many of them leveraged to their advantage in the wild-west asset-stripping days of the early 1990s. The next major step in Gorbachev’s economic reform was the 1988 law on cooperatives, which allowed people to set up their own businesses. British economist Philip Hanson describes this as “the most radical of all Gorbachev’s economic measures so far… Members of a cooperative could be few or many, and they could employ non-members. A cooperative was therefore capable of being a capitalist partnership, with the members exploiting, in Marxist terms, the labour of non-members”.18 Strictly speaking these cooperatives were not allowed to employ other people’s labour, but icn reality this regulation was observed almost exclusively in the breach. Initially most of the cooperatives were cafés, restaurants, hairdressers and small construction firms – exactly the sort of business that tends to be quite effectively run on a small scale. However, the cooperative movement quickly came to be dominated by “pocket banks used by their founding enterprises to move funds around discreetly and cooperative banks that were able, when foreign-currency and government debt markets developed, to make large profits from playing very thin financial markets”.19 Many of the fabulously wealthy Russian gangster-capitalists of the 1990s made their start in ‘cooperative’ banks in the late 1980s. In 1990, the USSR went into recession for the first time. By 1991, its economy was in freefall. In 1986, Gorbachev and his advisers came up with the concept of glasnost (‘openness’) to encapsulate policies of greater government transparency, wider political discussion and increased popular participation. Corruption and inefficiency would be tackled, and more information would be made publicly available. At first, it sounded fairly innocuous – what reasonable person would object to a deepening of socialist democracy? However, it quickly became a battle cry for an all-out attack on the legitimacy of the Communist Party of the Soviet Union and on the foundations of the Soviet identity. In short, it became a powerful weapon in the hands of social forces hostile to socialism. The political freedoms available in the west are much constrained owing to the correlation between wealth and power. Ordinary citizens have the right to vote, but their choice is nearly always restricted to two or three pro-capitalist, pro-imperialist parties, between which there is little substantive difference (so rare is the appearance of a meaningfully different option within mainstream politics, that when it happens it sends the ruling class into a frenzy of confusion, as is being witnessed at the moment with the rise of the Labour left under the leadership of Jeremy Corbyn). Actual power is monopolised by the wealthy, and challenging it can be extremely dangerous, as is evidenced by the treatment of Irish Republicans that have served time in Britain’s colony in the north of Ireland, or the many longstanding black, Puerto Rican and indigenous political prisoners in the US who have spent decades behind bars on account of their struggle for equality and human rights. In a context of ongoing class struggle waged by the working class of a socialist country against its internal enemies (those that want to restore feudalism or capitalism) and its external enemies (the leading capitalist countries that will inevitably work to destabilise a socialist country), a level of political repression is an unhappy necessity; this is elaborated in the article on ideological deterioration28 in relation to Khrushchev’s denunciation of Stalin. The needs of the few – to get fantastically rich – can’t be allowed to compromise the needs of the many to enjoy a dignified, peaceful and fulfilling life. The Soviet political system was undeniably rife with problems: the alienation and disaffection of young people, excessively centralised decision-making, corruption, arbitrariness by police and officials, insufficient levels of popular participation in the soviets, and more. But these weren’t problems that could be solved by imitating a western bourgeois-democratic model that had no cultural and social basis in the USSR. Rather, political reforms should have attempted to build on and improve the existing system, along the lines envisaged by Yuri Andropov. Szymanski describes “a few basic assumptions of Soviet society” that were not debated in the press: socialism as a system, communism as a goal, and the leading role of the Communist Party. “These issues are considered to have been settled once and for all and public discussion of them is considered by the regime to be potentially disruptive of popular rule.” This is consistent with Fidel Castro’s famous formula: “Within the revolution, everything; against the revolution, nothing.”30 These basic assumptions of socialism can be compared with the basic assumptions of capitalism: the supremacy of private property; profit as the major engine of economic activity; exploitation of labour as the source of profit. Gorbachev didn’t have widespread support for his economic reforms within the CPSU. This was partly due to a culture of caution and conservatism, but more importantly because Gorbachev’s schemes weren’t convincing and well thought out. The risk was too great in the eyes of many party veterans, particularly given the absence of a reasonable plan for gradual reform by carefully managed trial-and-error and with a clear rollback mechanism. Glasnost, then, was an attempt to “unleash the public”, where the public was defined as people who unambiguously supported perestroika. 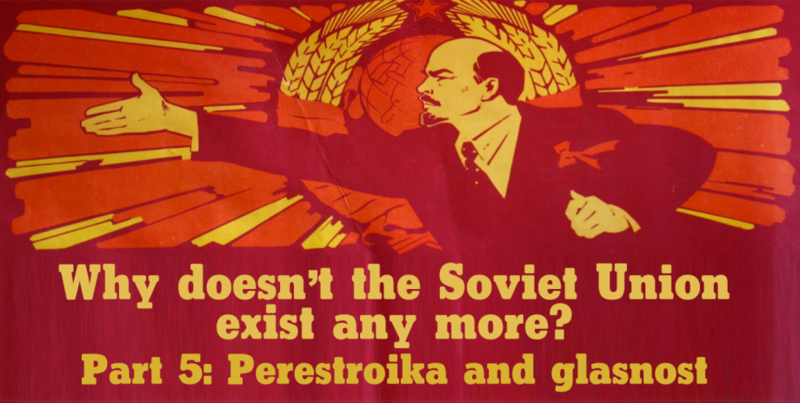 Continuing support for perestroika was to be found primarily outside the party leadership, particularly among capitalist restorationists, anti-Soviet nationalists of assorted hue, sections of the intelligentsia, and the new generation of small capitalists and managers that couldn’t wait to get filthy rich. The elected chairman of the Supreme Soviet would essentially be an executive president – a post designed by Gorbachev, for Gorbachev. Keeran and Kenny assess that “the proposal, introduced in the final minutes in a surprise resolution by Gorbachev in the chair, amounted to the overthrow of the Central Committee.” Disoriented by the sudden appearance and radical nature of the proposals, a majority of delegates voted in favour. The newly-created organs of power were chaotic, but they were much easier than the older structures for Gorbachev and his team to dominate, since they were largely composed of people that had been encouraged and promoted by Gorbachev and the increasingly anti-communist press. As a result, Gorbachev’s team suddenly had a mandate to accelerate the pace of reforms to a dangerous degree. Meanwhile, the new political space provided nutrient-rich soil for assorted right-wing nationalist movements around the country, leading to a bumper yield of insurrection and instability over the course of the ensuing three years. Later in 1988, Gorbachev moved against the more traditionalist (that is: communist) members of the party leadership. The most senior official, Andrei Gromyko – a key negotiator at Yalta and Potsdam in 1945, foreign minister from 1957 to 1985 and Chairman of the Presidium of the Supreme Soviet from 1985 until 1988 – was removed from the politburo. Nikolai Baibakov was fired as head of the central planning agency after two decades, in spite of his vast wealth of experience (which included overseeing Russian oil production during World War 236). Yegor Ligachev, who had become increasingly vocal in his critique of perestroika, was demoted from head of ideology to head of agriculture. As the communists were systematically removed from the party and state leadership, supporters of ‘radical reform’ were promoted, including a certain Boris Yeltsin. Ligachev’s role as head of ideology fell to Alexander Yakovlev, Gorbachev’s closest political adviser and widely regarded as the “godfather of glasnost”, wielding what Keeran and Kenny describe as “the most powerful and pernicious influence of anyone on the entire reform process”. We now know that Yakovlev had long since given up on his commitment to Marxism and had his heart set on transforming the Soviet Union into a multiparty parliamentary democracy and market economy along the lines of Canada (where he had spent ten years as Soviet ambassador). Initially he hoped this could be achieved through reforms, but he reveals in his memoirs that, with the reins in his hands, he decided that nothing less than counter-revolution would do. It is unprecedented in any social system for the ruling class to hand over the state’s propaganda apparatus to its class enemy. What Gorbachev, Yakovlev and co did was akin to the British government handing management of the BBC over to the IRA, or Cuba’s Prensa Latina appointing Marco Rubio as its editor. Added to all this was the fact that Gorbachev and his allies decided to end restrictions on foreign propaganda, for example putting an end to the jamming of Radio Liberty45 – a generously-funded propaganda arm of the CIA, focused on spreading anticommunist lies around the socialist countries of Europe. So Gorbachev’s idea of “improving socialism” was in fact based on bulldozing its structures and legacy. By 1991, the job of destroying the CPSU was almost entirely complete. New York Times columnist Esther Fein was all too accurate when she opined in July 1991 that “the Communist Party’s decline in power and prestige is perhaps the most critical development in the reform of the political system.”47 This act of grand-scale political vandalism remains Mikhail Gorbachev’s principal endowment to the world. Attacking the CPSU backfired badly for Gorbachev. He had made a dangerous assumption: that the liberals and nationalists he promoted would give him the political support denied him by the communists, thus allowing him to realise his dreams of a mixed economy with a welfare state and political pluralism. In fact, these elements wanted to go much further than Gorbachev. They didn’t want Nordic-style social democracy; they wanted full-scale neoliberal capitalism of the Milton Friedman variety. Soon enough they turned against Gorbachev and started looking for other means to promote their cause, stirring up nationalism and unrest, building openly pro-capitalist networks and attracting concrete support from the west. The next article in this series will deal with the events of 1989-91; that is, the outright collapse and disintegration of the Soviet Union.